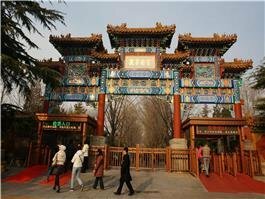 In the northeast of central Beijing, the biggest Tibetan Buddhist temple in Beijing is a popular worship place for locals. 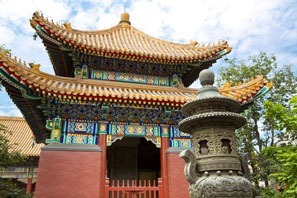 With 300 years of history, Yonghe Temple (the Lama Temple) has three world-record masterpieces. 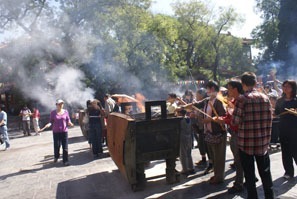 The locals are burning incense to Buddha. 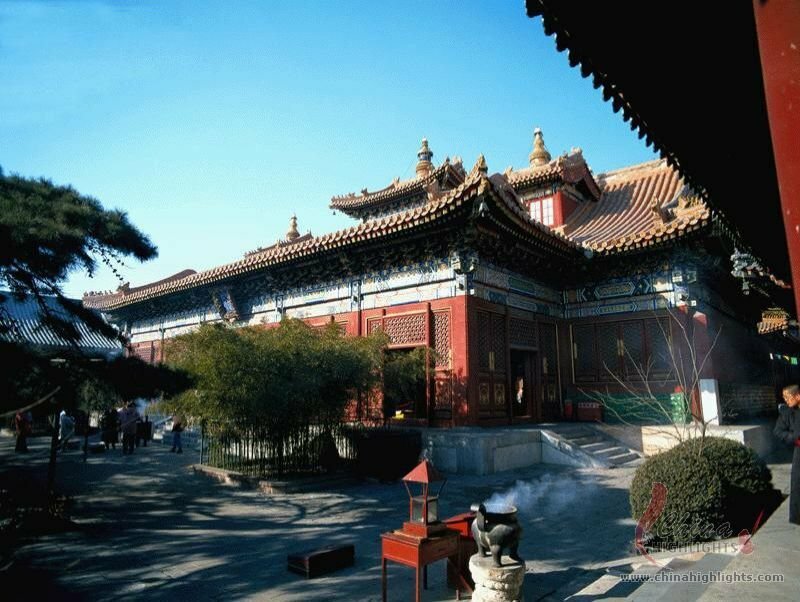 Visit the palace of Prince Yongzheng (1678–1735) of the Qing Dynasty. See thelargest sandalwood carved Buddha in the world. Experience the locals’ favorite worship place and how they burn incense to Buddha. Listen to the chanting of the monks. Enjoy its convenience for food or hutong (ancient alley area) tours. 1694: It was built as the Royal Court of Prince Yongzheng. 1722: Elevated to imperial palace status when Yongzheng became emperor for short stays away from the Forbidden City, its name was changed to Palace of Eternal Peace (Yōnghé Gōng). 1744:It became an official Tibetan Buddhist temple, and became the Beijing office of Tibetan Buddhist affairs, run by the Qing government. 1949: Yonghe Temple was declared a national monument. 1966: It was closed for the Cultural Revolution. 1981:It was reopened to the public as a Tibetan temple for tourism and worship. There are five main buildings separated by courtyards. Building heights reduce from south (the gate hall) to north. It has all the traits of a grand Chinese Buddhist temple entrance. There are two lifelike bronze lions sitting in front of the hall, which give people a sense of seriousness, before they cross the threshold. In the middle of the hall, there is the statue of Buddha Maitreya seated on a golden lacquer throne. 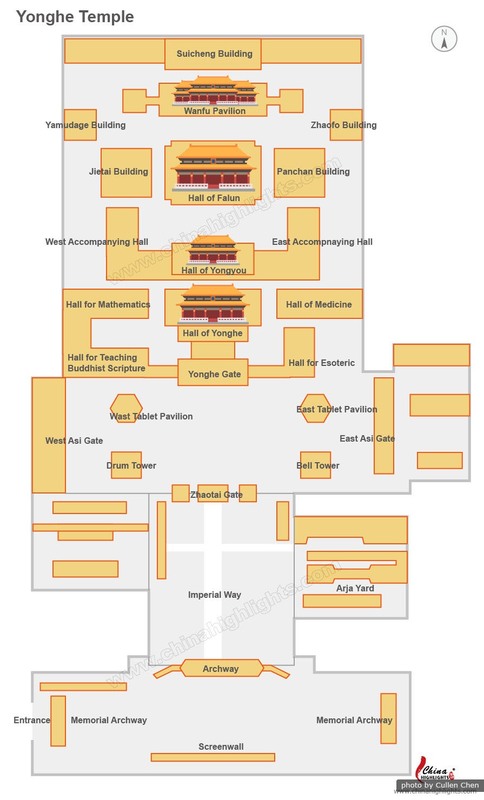 It is also called the Palace of the Heavenly Kings, as, on both sides of the hall, stand statues of the Four Kings of Heaven. The Kings of Heaven are sculpted stepping on demons, which indicates that the Kings of Heaven have suppressed evil spirits and have the duty of protecting the world. It is the main hall of the Temple, formerly known as the Yin’an Hall. 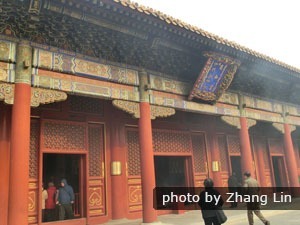 It was where Prince Yongzheng met with government officials. 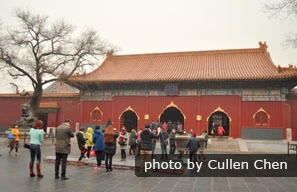 It was later converted to a lama temple, which is simialr to the Gate Hall of Harmony and Peace. Along the two sides of the wall stand the 18 Arhats. In Chinese folklore, they represent protection. A mural depicts Guanyin, the Goddess of Mercy, blessings, and fertility in China. The Hall of Everlasting Protection seems like five buildings from the outside, though it is actually five pairs of buildings, each pair joined together. It used to be the living quarters of Prince Yongzheng. Later, it become a hall of prayer. When emperors died, their coffins would be temporarily store there. Monks would pray for them and then bury them. So, the name of this hall refers to prayers of everlasting protection prayed over dead emperors. Today, there is a statue of the Bhaisajya Guru (the ‘Medicine Buddha’) in this hall, who represents protection and healing in China’s Buddhist culture. Here the cultures of Han Buddhism and Tibetan Buddhism meet. 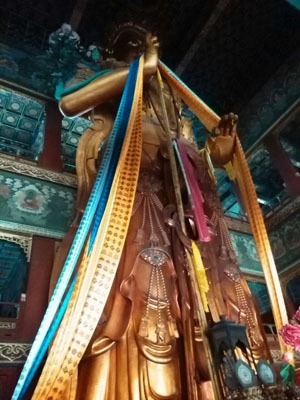 A bronze Buddha sits on the huge lotus stage at the middle of the hall, 6.1 meters high. With a smiling face, he is the founder of Geluk Tibetan Buddhism, Je Tsongkhapa. Behind is the second of the three unique, world-record-holding, treasures of the Lama Temple. About 5 meters high, 3.5 meters wide and 30 cm thick, the red sandalwood Five Hundred Arhat Hill carving has Arhat statues made from gold, silver, copper, iron, and tin. 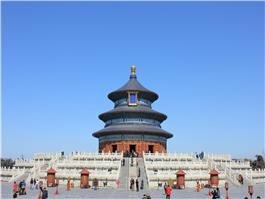 The 25-meter-high Pavilion of Ten Thousand Happinesses is sometimes referred to as "The Hall of Boundless Happinesses". There is a gantry connecting the two halls of this pavilion, built in 1056 with architecture from the Liao Dynasty (907–1125). The statue of Buddha Maitreya in the hall, carved from one precious white sandalwood log from Nepal, is the biggest wooden buddha in the world. 18 meters high above ground, and 8 meters deep below ground, the Buddha&apos;s body is 26 meters high and 8 meters wide. 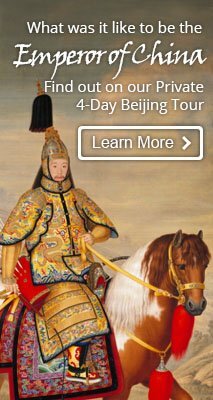 The seventh Dalai Lama gifted Emperor Qianlong with the sandal wood in the 1750s. 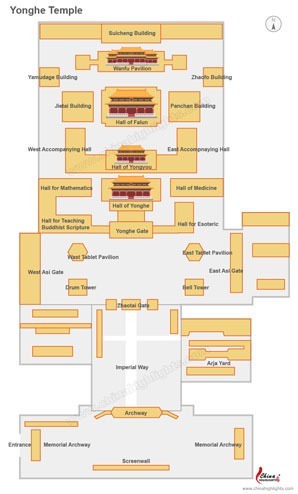 Take Line 2 to Yonghegong Lama Temple Station and leave from Exit C.
Take Line 5 to Yonghegong Lama Temple Station and leave from Exit F.
Take bus 13 and 684, and get off at Guozijian Station. Take bus 116 and 117, and get off at Yonghegong Lama Temple Station. Take bus 2, 18, 44, 62, 606, 800, 858, or 909, and get off at Lama Temple Bridge East Station. 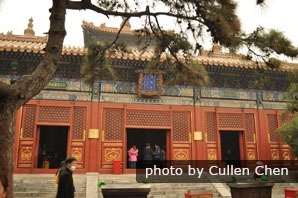 Please note: As the Lama Temple is the most popular place for blessings in Beijing, it will be packed with locals praying around the time of traditional festivals and important examinations. It can be a good opportunity for you to experience the Buddhist culture in China or a bad time to avoid if you prefer quieter locations. Dayuan Invocation Dharma Assembly is one of the most important festivals of Tibetan Buddhism. It commemorates Sakyamuni, the founder of Buddhism. During the Dayuan Invocation, monks will chant scriptures to pray for a peaceful year. This week-long festival is held in the period mid-February to mid-March (from the 23th of the first lunar month to the 1st of the second month). Monks of the Temple get up and go to the temple at 2am on the first day of China’s New Year, chanting till the sun comes up. On this day, many people flock into the temple to pray for the coming year. Contrast two pillars of Chinese culture: compare Confucianism here with Buddhism at Yonghe Temple. 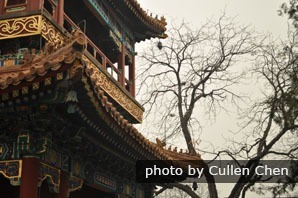 Beijing Imperial Academy : About 300 meters from Yonghe Temple, Guóz ǐ Jiàn was the national central institute of learning in imperial China, the highest institute of learning in China&apos;s traditional educational system. 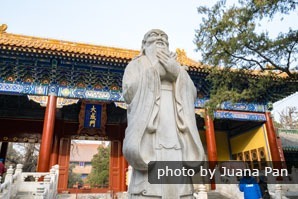 Confucius Temple: right next to the Confucian Imperial Academy is one of the best Confucian temples in Beijing. 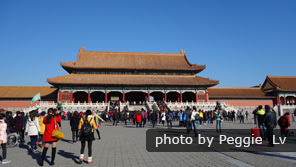 We provide one of the best tailor-made tour services in China, and can tailor the Lama Temple and any other attractions you want into your Beijing tour. With our expert and experienced tour guides and comfortable private transport, all you need to do is enjoy the tour! Click here for your tailor-made tour plan.